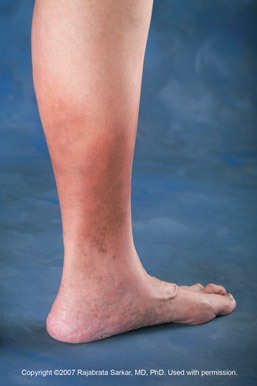 Skin discoloration of the legs, also known as “hyperpigmentation”, is an indication of late-stage chronic venous insufficiency. When vein valves fail to direct blood back to the heart and blood leaks into the tissue around your veins, pressure will cause the smallest veins (called capillaries) to burst. The result is skin discoloration in these areas, usually a shade of brown or reddish brown that looks darker than normal. These changes can be permanent and may lead to other symptoms, including itching legs and sores or ulcers, which typically present above the ankle on the inside of the leg. Women over the age of 50 are most susceptible to developing CVI, but many factors can contribute to the onset of vein disease, including a family history of CVI, obesity, pregnancy and high blood pressure. CVI is also more common in individuals who spend much of their time on their feet, such as EMS workers, retailers and food service workers. Chronic venous insufficiency can also develop in individuals who live a sedentary lifestyle. The only way to treat skin discoloration is by treating the chronic venous insufficiency responsible for it. Your doctor may recommend elevating your feet several times a day for 15 to 30 minutes and wearing compression stockings to combat blood pooling and encourage better blood circulation. He or she may also apply a gauze dressing steeped in Zinc Oxide paste. To treat CVI, an interventional radiologist will perform a minimally invasive procedure to improve circulation. Possible procedures include: endovenous radiofrequency ablation (RFA), ambulatory phlebectomy and ultrasound guided sclerotherapy. If you are experiencing skin discoloration on your legs and believe it may be related to CVI, schedule a consultation today and learn more about available treatments for you.